When traveling on the north west coast we needed to stop at Crescent City not because of its beauty but due to the necessity to rest. 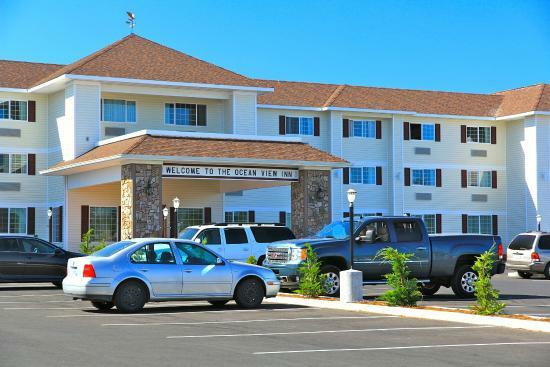 There are few accommodation possibilities for demanding travellers and so we settled for possibly the best hotel on site, the Ocean View Inn & Suites. As its name implies, the Ocean can be seen from there but the hotel is situated quite a distance away from the sea. It’s probably one of the newer hotels in town. The reception area and the adjoining public space are rather specially furnished but there is no accounting for taste. The first room they gave us, a Family Suite with 1 King & 2 Queens, was just by the reception facing the driveway. After we had rejected this room, we were offered without a lot of fuss one of the same category on the second floor facing the bay. You could see the Ocean but only behind electrical wire, grass and trees. Never mind! The Family Suite is spacious and adequately equipped but is far from being de luxe. From my point of view, the furnishings are mismatched but that’s – as already mentioned – is a question of taste. Anyway, we felt comfortable enough. The staff was helpful and friendly. We didn’t have the free continental breakfast as we wanted to have a full one. All in all, the Ocean View Inn is most likely the first choice in town when heading from one sight to the other on the north west coast.